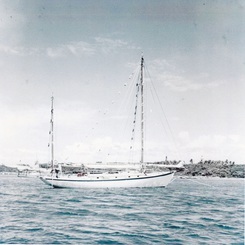 THETIS, 1961, departing Hatchet Bay Eleuthera, Bahamas. The picture was taken from a boat who's name I (Norm) have forgotten but once knew so well. The owner edited the cruising guide of the day for the Bahamas. It was pretty cool to see the picture in the guide for a few of the following years. The boat was built in Wiscasset Maine in 1921 to a design by John Alden. The original name was Hermita from Marion MA. My parents bought the boat in 1959 after spending about a year looking at boats. 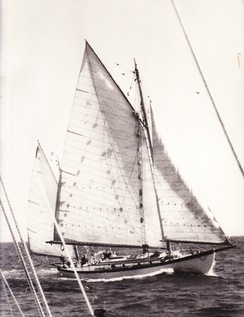 We bought Thetis in Stamford, CT and sailed her to Stage Harbor Chatham, MA in the Spring of '59. I made the voyage as an 8 year old about to turn 9 and it was the best thing I could think of at that time. The trip was cold, the boat smelled the way only an old boat that had been laid up in wet storage for a few years can smell, and nothing really worked. 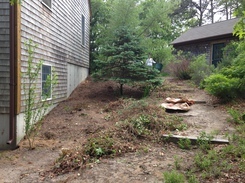 The last two days of the four day trip were pretty stormy with a strong North Easter beating the Cape and waters of Nantucket Sound and Vineyard Sound. She wrote a superb description of searching for a boat and then making the first voyage home. The seller does not deliver the boat to you! I enjoyed reading her story. It brought back great memories and here you have one. First Voyages. In 2007, we retraced many of the steps of my very first open water voyage as we brought Averisera home to Boston, MA. That was a memorable first voyage. At anchor off Great Stirrup Cay, Bahamas, 1961 shortly before we sailed back to Cape Cod for the summer. There were two boats in the anchorage, us and Falcon, a Hood designed Tor-40. There were kids on Falcon and we loved being in any anchorage with them. 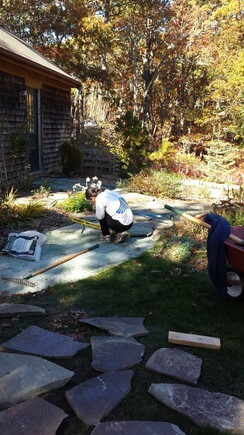 If nothing else, life on Cape Cod is defined by the work done on one's house. 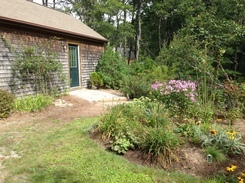 It is "life" on the Cape at its very best. 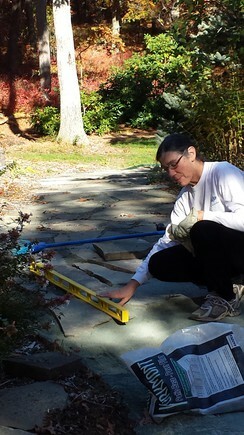 We learned a few tricks about handling really large heavy flagstones, using stone dust and sand as bedding, and making a design using color shape and texture. The list is endless and the joy immeasurable.